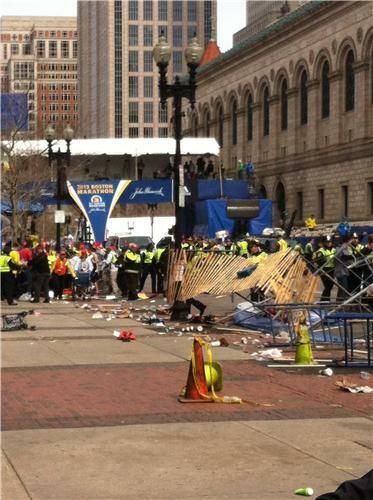 Heard one loud explosion here at the media center at the Fairmont Copley. Lobby full of people who came in from the street. In lockdown now. 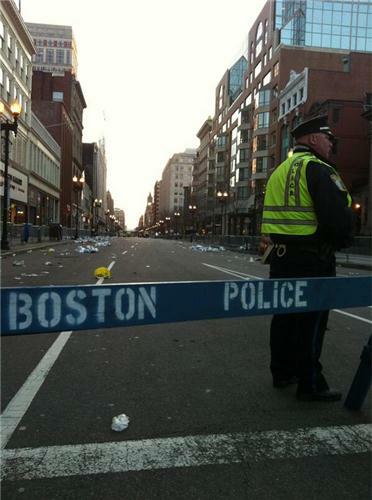 Channel 4 is reporting that there were two consecutive explosions near the finish line of today's Boston Marathon. 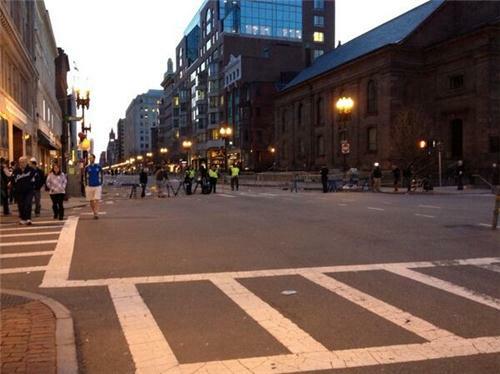 One was near the Marathon Sports store at 671 Boylston; the other was further down Boylston closer to Mass. Ave. 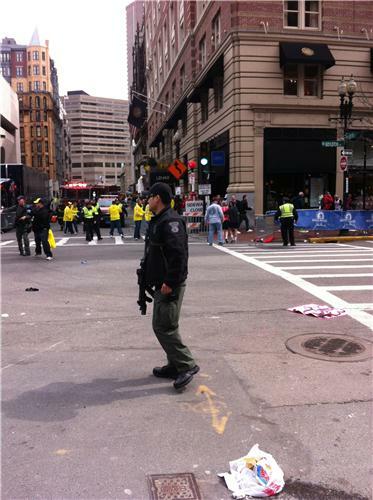 The windows of the Marathon Sports store at 671 Boylston were blown out by the explosion. 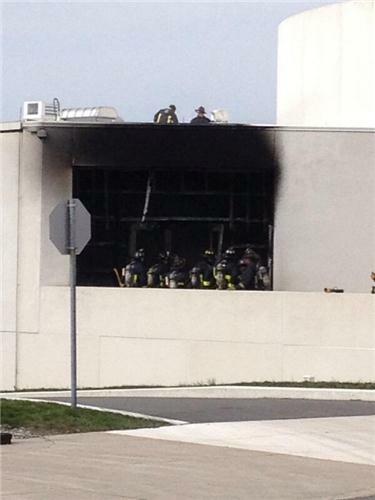 An eyewitness told Channel 5 that the explosion at Marathon Sports was "an absolute ball of fire" and appeared to have come from inside the store. Andrea Storer from Connecticut, speaking in the lobby of the Fairmont Copley Plaza hotel, said she was about a block away when she heard two explosions. 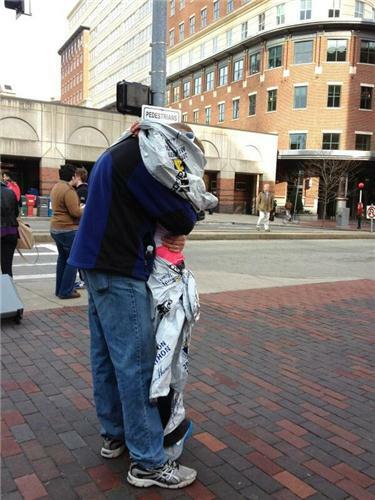 "A big explosion, huge explosion right near the finish line," she said through tears. "It was huge. There had to be people killed. There had to be. It was a huge explosion. It was the loudest noise, and all the smoke. Two went off." 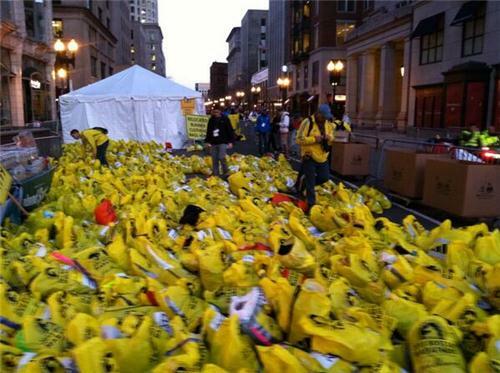 Because of the massive number of medical personnel in the Boston Marathon medical tent for today's race, the injured were taken there for treatment. 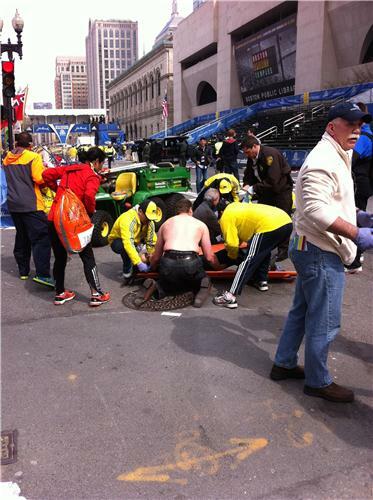 A Boston University student was among those critically injured in Monday's explosions at the Boston Marathon, BU President Robert A. Brown reported this evening. In an email to staff and students, Brown said he could not provide more details about the injury or the student. 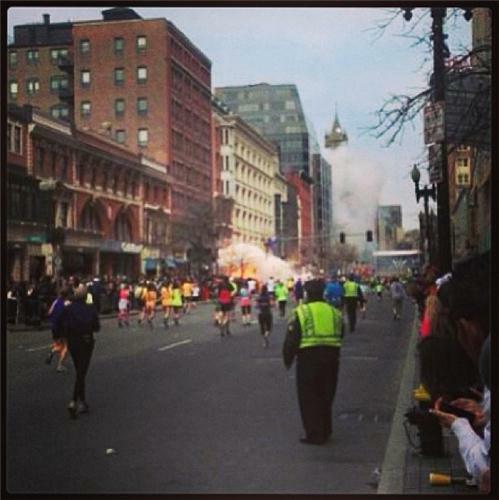 We are still learning about the explosions that occurred earlier today near the Finish Line for the Boston Marathon. 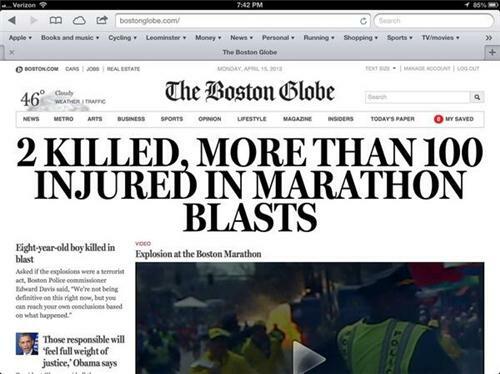 We now know that the two explosions at the Finish Line were the result of devices planted at the scene and we also know that additional unexploded devices have been found. 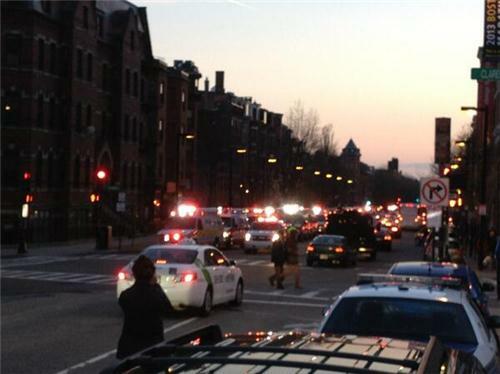 Two people were killed and many more seriously injured, including a Boston University student who was critically injured (we cannot yet identify the student). 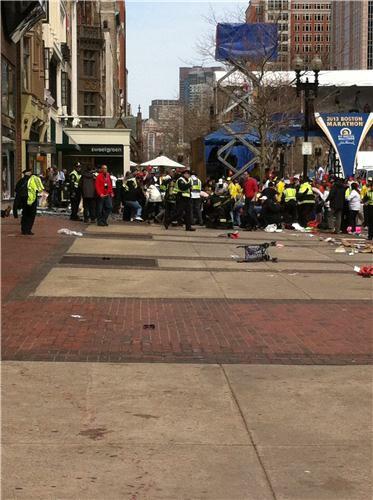 Boston University police have stayed on duty to protect our campus and support Boston and state police. Our thoughts and prayers are with the families who have experienced a dreadful loss and those whose loved ones are terribly injured. 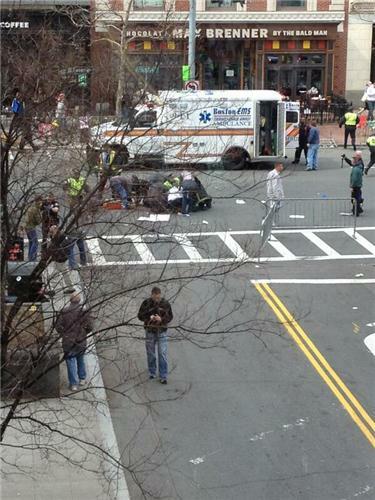 Obviously we will work with safety officials to understand as much as we can about what has happened. We are advising all Boston University students to stay in their residence halls and apartments and continue to follow the guidance of the Boston Police Department. All community members who are not on campus should stay home and avoid the immediate area. Please monitor BU Today for updates about University actions that we take as we learn more. 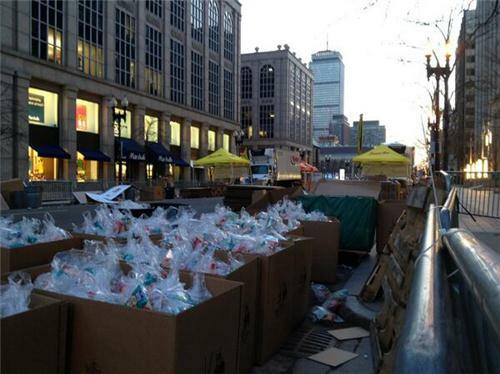 RT @RenLavoieRDS: Moment of silence at Bell Center for Boston victims.